Douglas and Co. Detroit is holding a preview party on November 22 to kick off the launch of its new leather goods manufacturing business. The company will begin selling its high-quality items online the same day at 8 a.m. EST and is seeking partnerships with retailers interested in carrying its unique product line, which is made in Detroit. We allow our inspiration to lead us to behind the scenes of each product, which is really more than a product—it’s a process. Since we work in small production, we are constantly creating with intent. Michigan couple Shane and Melissa Douglas are pleased to announce the launch of their handmade leather goods manufacturing business, Douglas & Co. Detroit, as well as a new Website at http://www.douglasandcodetroit.com. In celebration of their business venture, the budding entrepreneurs will host a preview party from 4 p.m. to 7:30 p.m. November 22 at the store Nora Modern located at 4240 Cass Ave. in Detroit. The public is invited to attend the grand opening event, along with any individuals and stores that may be interested in partnering with the company. Shane and Melissa Douglas are eager to introduce their exclusive handmade leather goods to the local area, as well as online. The company’s products will be available on its Website starting November 22. “The establishment of Douglas & Co. Detroit is a dream come true for us, and we are thrilled to bring high-quality leather products to the marketplace for people to enjoy,” Melissa said. Douglas & Co. Detroit specializes in producing premium products such as its Tuck & Sew bag, Executive Card Holders and Designer Clutch. The company also creates small gift items, including keychain holders and coasters. Its designs are completely original and are developed by Shane, a leatherworker who values quality, simplicity and versatility. His Designer Clutches, for example, can also function as a pen holder and a wallet, depending on the user’s preference. “This versatile product is a great option for anyone desiring a soft, well-made leather product,” he said. 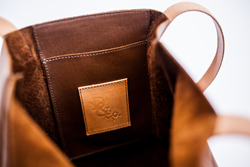 For more information about Douglas & Co. Detroit and its handmade leather goods, please contact Shane Douglas at 586-943-2000 or visit http://www.douglasandcodetroit.com. Douglas & Co. Detroit is a small manufacturing company fueled by creativity and big ideas. Founded by husband-and-wife team Shane and Melissa Douglas, the business was born out of the couple’s passion for crafting handmade leather goods. The launch of Douglas & Co. Detroit is a dream come true for Shane, a leatherworker, and Melissa, an artist, who enjoy applying their creative talents to develop the company’s exclusive line of practical products.